One of the nice things about losing a presidential election? You’re allowed to use your vast wealth to help out your (allegedly) corrupt buddies. To that end, the Washington Post reports that Mitt Romney has given $10,000 to former Virginia Governor Bob McDonnell’s legal defense fund. As you might recall, McDonnell and his wife, Maureen, got themselves into some trouble earlier this year, when it was revealed that they had accepted a wide array of fancy gifts (and money) from a sketchy Virginia businessman named Jonnie Williams. The couple is set to go on trial in July for over a dozen federal charges of bribery and fraud, which is expensive. 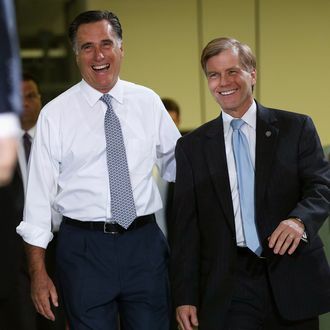 “Governor McDonnell became a true and trusted friend and ally through the good times and the bad times in the last campaign,” Romney adviser Ron Kaufman told the Post. “He did a great job running the [Republican Governors Association], he did a great job running Virginia and Mitt has a very special place in his heart for Governor McDonnell. He wanted to help him at a time when he needed help, just as Governor McDonnell would do for Mitt if he needed help.” Indeed, McDonnell did give Romney a showy endorsement right before the 2012 South Carolina primary. Kaufman said that McDonnell did not personally ask as Romney for the donation, though, “People around [McDonnell] brought it to Mitt’s attention.” After all, that’s what friends’ lackeys are for.